The complement fixation test is one of the major traditional tests for the demonstration of presence of specific antigens or antibodies. It requires a veritable zoo of reagents and numerous preparatory steps. There are almost as many versions as there have been users; the microtitre version developed at the Centers for Disease Control and Prevention (LBCF Test) includes rigorous controls and is commonly used. The complement fixation test (CFT) does not depend on hem-agglutinating activity of the virus, but the antibodies must fix the complement, and the sera must be free of anticomplementary activity. The test has been superseded, in many instances, by newer tests, such as enzyme immunoassay (EIA). The terminal components of the complement cascade, C789 (the membrane attack complex), can damage cell membranes in the presence of specific antibody, which fixes complement to the cell surface. In the CFT, erythrocytes are used as the target cell, because complement-induced leakiness of the membrane can be visualized or measured calorimetrically as an increase in free hemoglobin. In the presence of specific antibodies to an infectious agent, any complement in the system is bound, leaving no residual complement for reaction with antibodies to the erythrocytes. Thus, the presence of specific antibody is indicated by the absence of hemolysis. First step (Complement fixation stage): a known antigen and inactivated patient’s serum are incubated with a standardized, limited amount of complement. #Note:patient’s serum is heated at 56°C for 30 minutes to inactivate endogenous complement which may disturb the test calibration. If the serum contains specific complement activating antibody, the complement will be activated or fixed by the antigen-antibody complex. 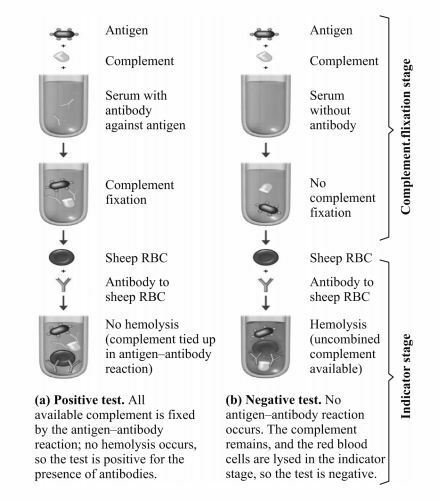 However, if there is no antibody in the patient’s serum, there will be no formation of antigen-antibody complex, thus complement will not be fixed but will remain free (In the indicator stage this complement will react with RBC coated with antibody to sheep RBC ). Second step (Indicator Stage): The second step detects whether complement has been utilized in the first step or not. This is done by adding the indicator system. If the complement is fixed in the first step owing to the presence of antibody there will be no complement left to fix to the indicator system. There won’t be any lysis of RBCs. However, if there is no specific antibody in the patient’s serum, there will be no antigen-antibody complex, therefore, complement will be present free or unfixed in the mixture. This unfixed complement will now react with the antibody- coated sheep RBCs to bring about their lysis. is significant and indicates infection. Notes: All reagents must be free of anticomplementary activity, the correct quantity of complement must be added, and the control specimens must react as expected. Ability to screen against a large number of viral and bacterial infections at the same time. Thank you so much for pointing the error. The error has been corrected. I hope to get similar feedback from you in upcoming days too. The purpose of using RBC is for indicator stage. Reactive and Non-reactive test (i.e. presence or absence of Ab) is determined by hemolysis (or no hemolysis). We need RBC which can be hemolysed on this test conditions and RBC of the sheep is the good match (we use sheep blood to make Blood Agar too; you can find out more here why we use sheep blood (which is previous) compared with expired human blood). how d0 you quantify positive results? Dear Anderson, patient’s serum is heated at 56°C for 30 minutes to inactivate endogenous complement which may disturb the test calibration. After that we use standardized complement. please define the standardized complement? what is it ? how an i get it ? and second asking is why the complement (that inactivated by heating ) disturb the test calibration? please Sir explain this point…. How long does it take to get results from this blood test? Well explained thanks… My question How dilutions are made to interpret diagnosis ?? If anybody have CFT level in his body is 43000 than what he has to do and what are its side effects?